The Herald Brass was formed the end of 2003 for the purpose of traveling to Turkey for a cultural exchange. We arrived in Tarsus and immediately left for Cappadocia. 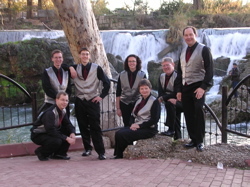 Our time in Cappadocia was spent sightseeing and practicing for the upcoming concerts, usually in the hotel lobby. Our first concert was in Antakya (Antioch). We had the opportunity to play in one of the local churches. The church was small so many people had to stand to hear us. We spent most of our time in Tarsus. We were able to fit in a little sightseeing in between our concerts. This road dates back to the time of the Roman Empire. We played at the Tarsus American School, a well known international school, for a high school assembly. We presented various types of music including classical and Christmas songs. Some of our concerts included audience participation. Our main concert was at the Tarsus Cultural Center. We had a large crowd that came out to hear us on Saturday evening. Our final concert was on Sunday morning at St. Paul's Church in Tarsus. It is a tourist attraction but can be rented out for events.